We had Nasi Dagang for dinner last night. This is more a favourite with me rather than B but the new restaurant we've been frequenting serves the tastiest Nasi Dagang that even B is enticed. So far he's eaten this particular Nasi Dagang twice and each time he said it was delish! Nasi Dagang is a scrumptious Malaysian dish consisting of rice steamed in coconut milk, fish curry and other extras like fried shaved coconut, hard-boiled eggs, vegetable pickles and of course the spicy chilli sambal. It is a popular food item especially in the East Coast of Peninsular Malaysia, specifically in the states of Terengganu and Kelantan. I always ask for extra birds' eye chilli in my curry (if any) and the sambal too of course. Have you tried this spicy tasty dish? It's really yummy and one taste will get you wanting and craving more. Enjoy your dinner tonight okay? I have to get ready for buka (breaking of fast) now so I'll see you later! i'm breaking fast alone again, marzie.. i don't even know what i'm having yet.. just bread kot..
that really does look scrumptious.. kat mana ah this place?? That Trader Rice (nasi Dagang?) looks delicious. I cant recall last i had one. Maybe i should look for one. yummy yummy Marzie!! I really shouldn't blog hop on an empty stomach!!! my TD is behaving today, ane..
me too rizal!! 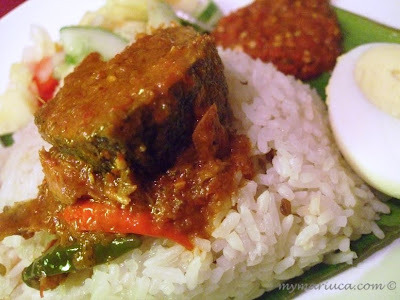 I haven't had "nasi dagang" in a loooong while.. but marzie's nasi dagang looks really good..
Nasi Dagang!? I have not heard of it. It's like Nasi Lemak, right? I wonder if I can find it in Singapore. Mmmm... I love Curry dishes! The spicier the better! I hope they have this in Singapore too. How come Shemah? J working late is it? Tak kan la makan bread je! Still haven’t checked out TD hmmm…. Hey Mon! U still up eh? Ohhhhh nasi kukus special with lauk … nice ah? Never tried..
Shah Alam the other day and he recommend this! Recent blog:=- X-Mini Capsule Speaker GT! Hmm....i'm not sure if I have tried it before or not. I think yes? Haha :D Can't even recall it. Sounds nice Mon… Shah Alam so hot! yalor so many things to do at this hour some more! i haven't started too! So now not sure Tekkaus? I think u’ve tried it before maybe dunno the name h ehe ..
huh? really ah u can see the Giant sign from yr condo? wahh!! Still at season 1 Mon? GIANT neon sign blinking Mon! Ha tu la, some scenes so ridic how not to laugh right?? Hahhaah! yalor some more SA doesnt have big shopping centre lol!!! Hahahahhaha hmmmm nothing la blinking in my house lolz! True…some more last time my dorm in SA…can imagine the boredom??? haha i can imagine the boredom!! no clubbing oso in SA right? LOL @ no clubbing in SA!!! Yeah lor… maybe got karaoke? ?